My loving husband came into the living room as we were getting ready for church Sunday morning. He had a shirt draped over his arm, which he held up for me to inspect. I have to give the guy credit. This was unusually early for him to approach me with a task to be done. We had more than ten minutes before we were supposed to leave. I was impressed. He has finally learned to live less dangerously. The Spouse and I don’t approach timely obligations in the same way. My motto is that if you arrive on time you are late, and if you arrive early you are on time. His theory is more along the lines of - I have to be there for 10 a.m., therefore I will step out of the shower at 9:50 a.m. I swear sometimes it’s like we live in different time zones. When I was pregnant with Second Born we were scheduled to attend a Lamaze refresher course. I made him swear he would be on time to pick me up and get there before the doors closed and it would be obvious we were the last ones to arrive. About 20 minutes before the class was to start, he called… from 30 minutes away. I’m sure you already know this did not end well. I got in my car and drove myself to the class. Spouse slipped in red-faced, about 10 minutes late. I did not deny he was with me, which would have been difficult anyway since I was the only excessively pregnant woman alone in the room. No further discussion was necessary when we left at the end of class. I believe, however, that Spouse knew if he showed up late when I went into labor, he might have to figure out if there is such a term as posthumous parenting. 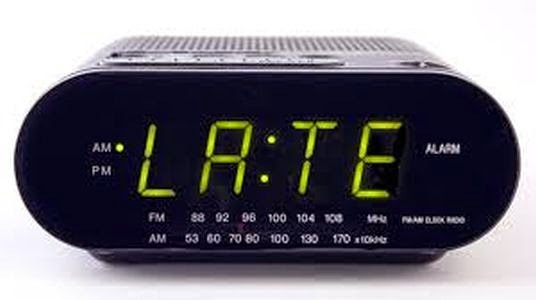 Spouse was not raised to be late, and in fact he unquestionably holds the record with family members for being that guy everyone is always waiting for. It drove my punctual parents crazy when we were dating. In our early years of marriage I had hopes of getting him to straighten out what I considered a horribly unacceptable habit. It turns out that instead of being a positive influence, I have simply become the one standing in the doorway speaking in a very (very) loud, impatient tone, making it crystal clear that I am not happy we are about to be late again. And again. Sometimes it’s all right to cut it close and appear just before the beginning of, say, a meeting you don’t even want to be at, or perhaps a party where you know the good snacks won’t be served for the first half hour. Other times it’s a little more awkward – like when you are being recognized for your accomplishments at that same meeting you didn’t want to attend. Yes, this happened to Spouse last year. After 30-something years I realize it’s probably time to give up on hoping to change my companion’s custom of waiting until the last minute for everything. Or maybe if he reads this he will be motivated to be right on time for the next thing. As long as I tell him it’s a half hour earlier. Most marriages operate in different time zones. So glad you can make this a humor column.